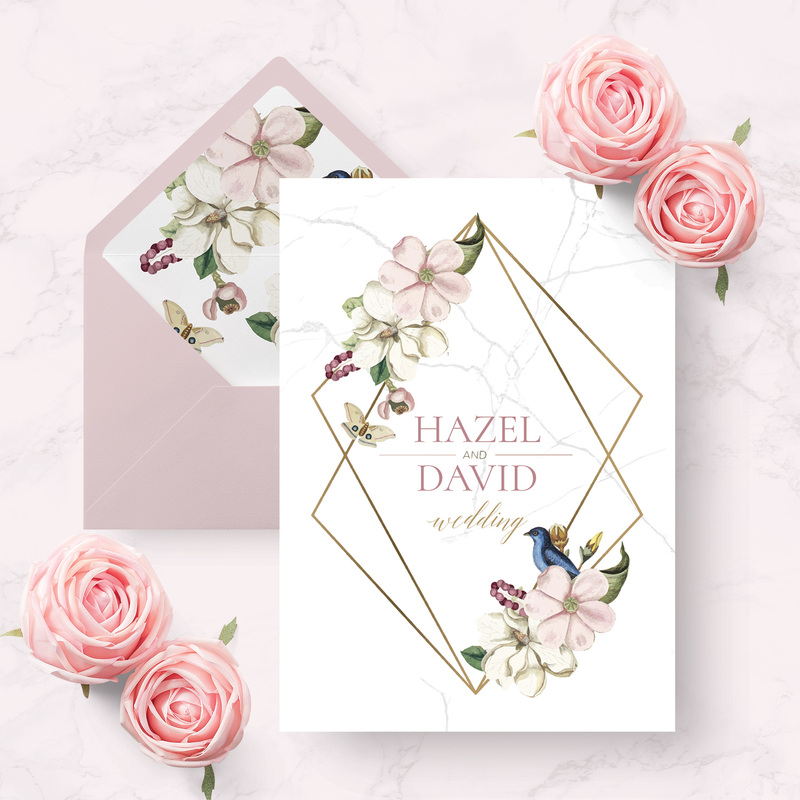 Wedding invitations are something you will always treasure. 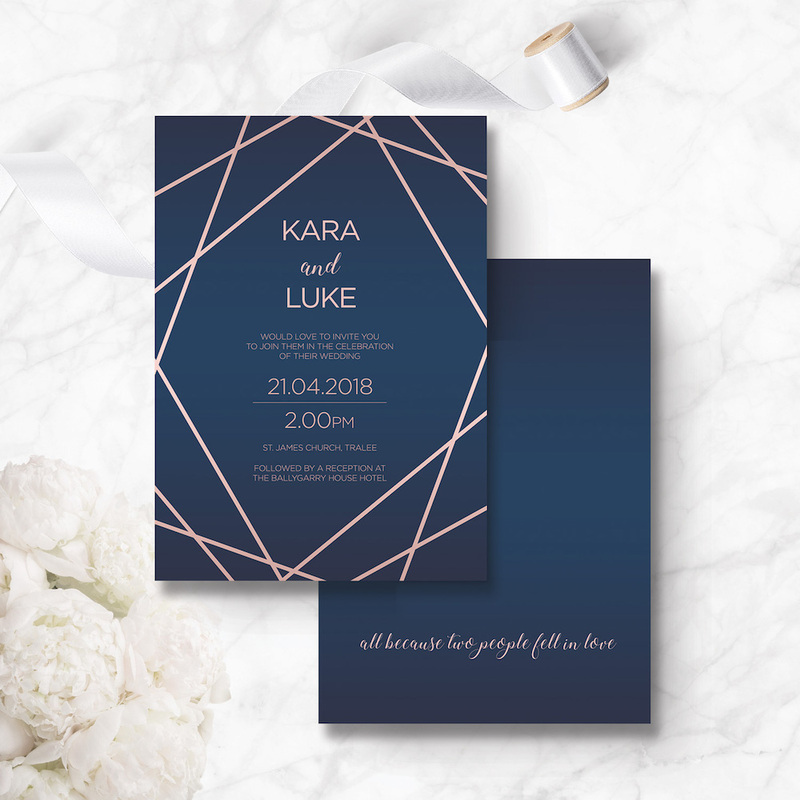 The process is very straightforward, we will discuss with you, your colours, themes and personal tastes to create a perfect design. 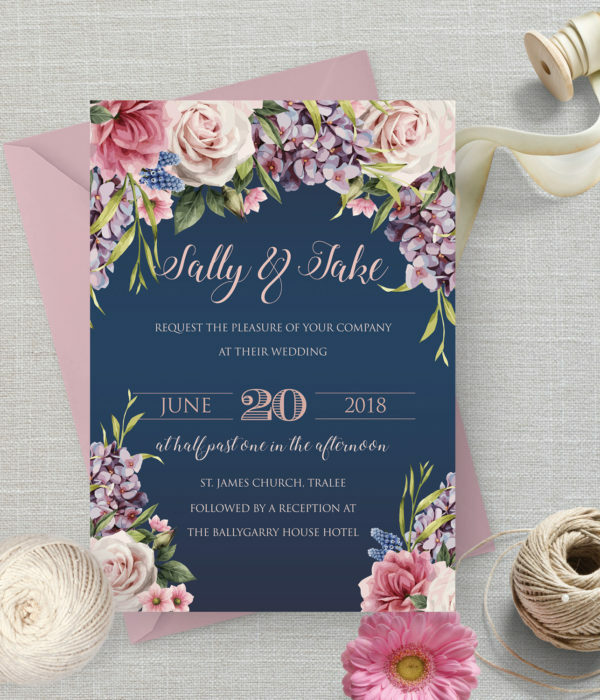 Remember our invitations come in a number of sizes. 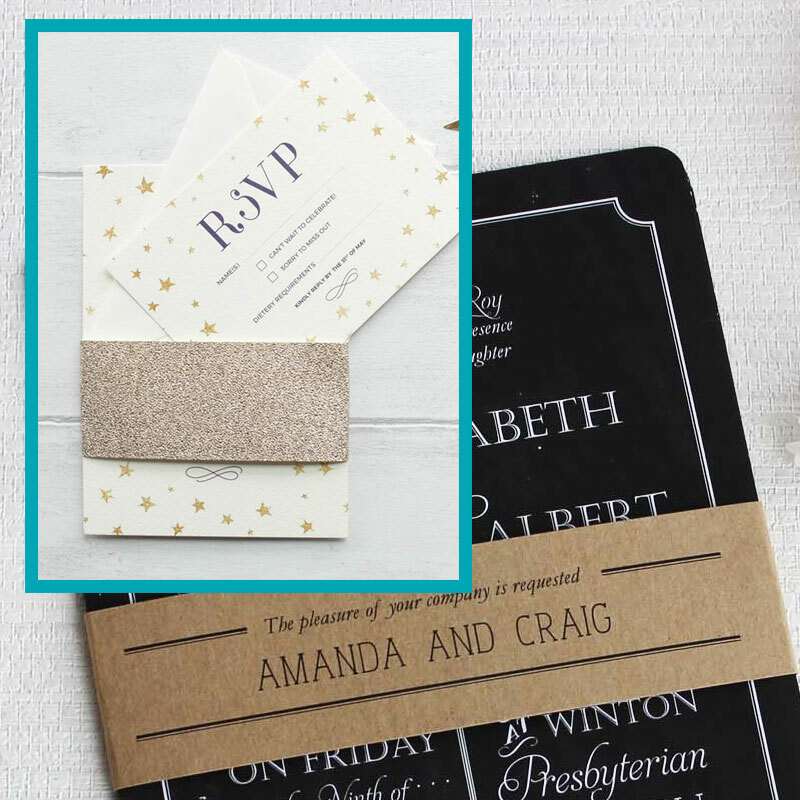 You can upgrade your invitations by adding a belly band, embellishment and coloured or shimmer envelopes. 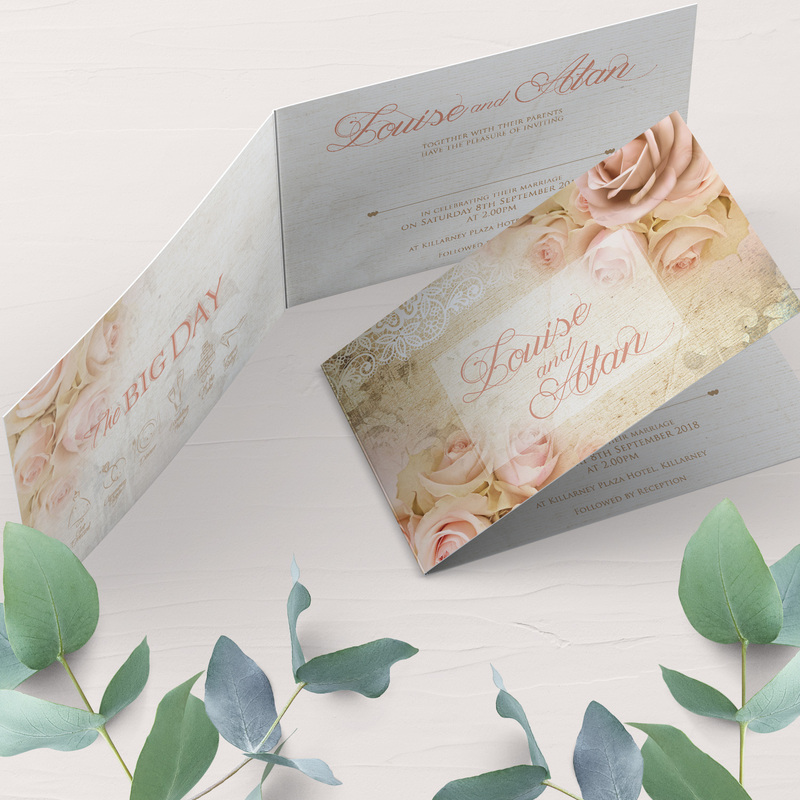 We print on two types of card: a Luxurious Pearl Shimmer Card and a Textured Matt Old Mill Card. 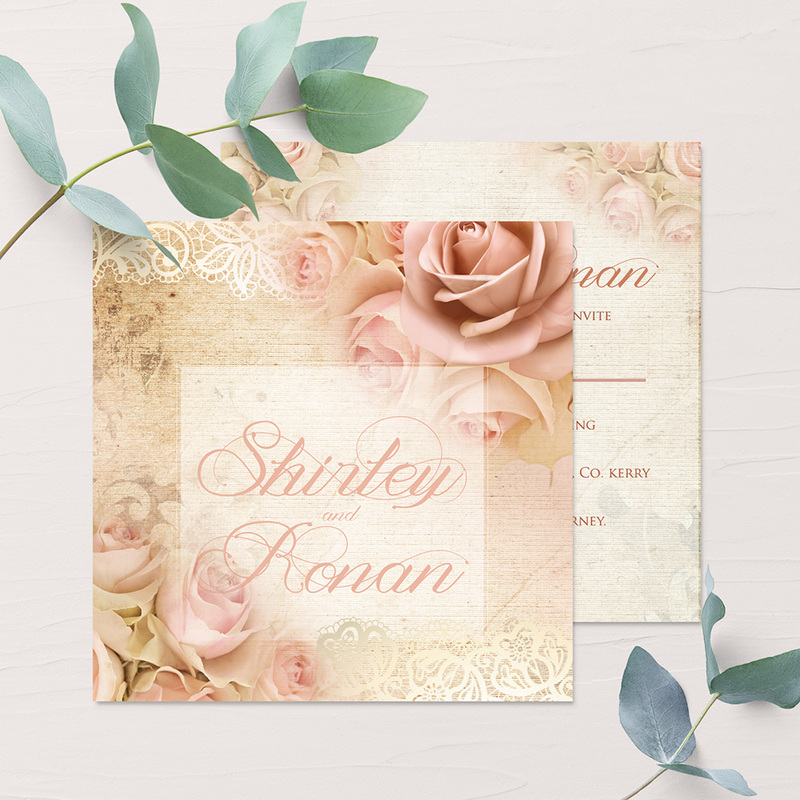 Kraft Card available on request. 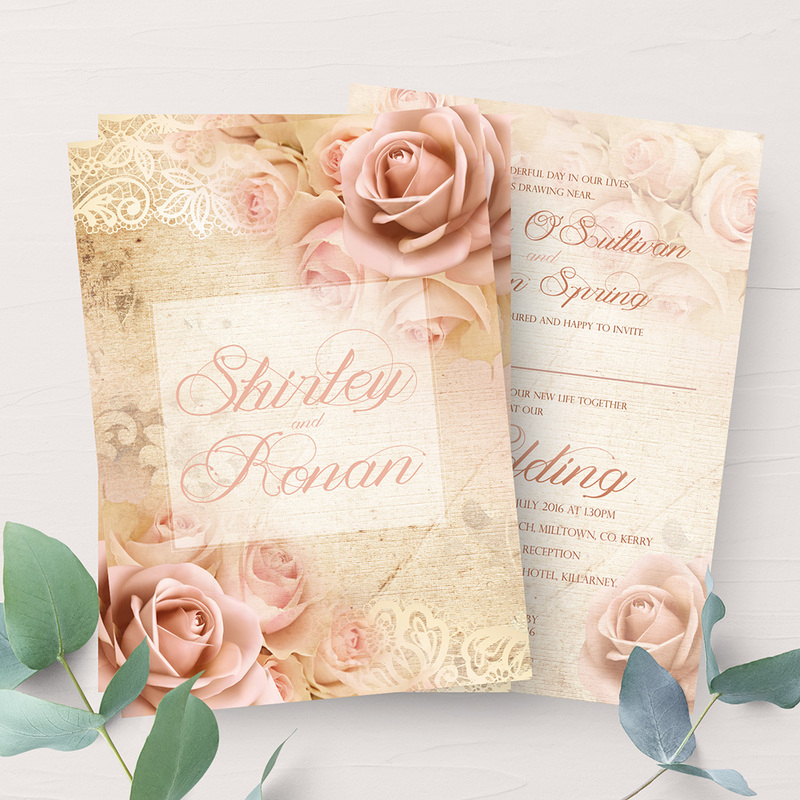 To find out more about how we can help you create your perfect bespoke wedding invitations please e-mail us at sinead@theinvitehub.com. 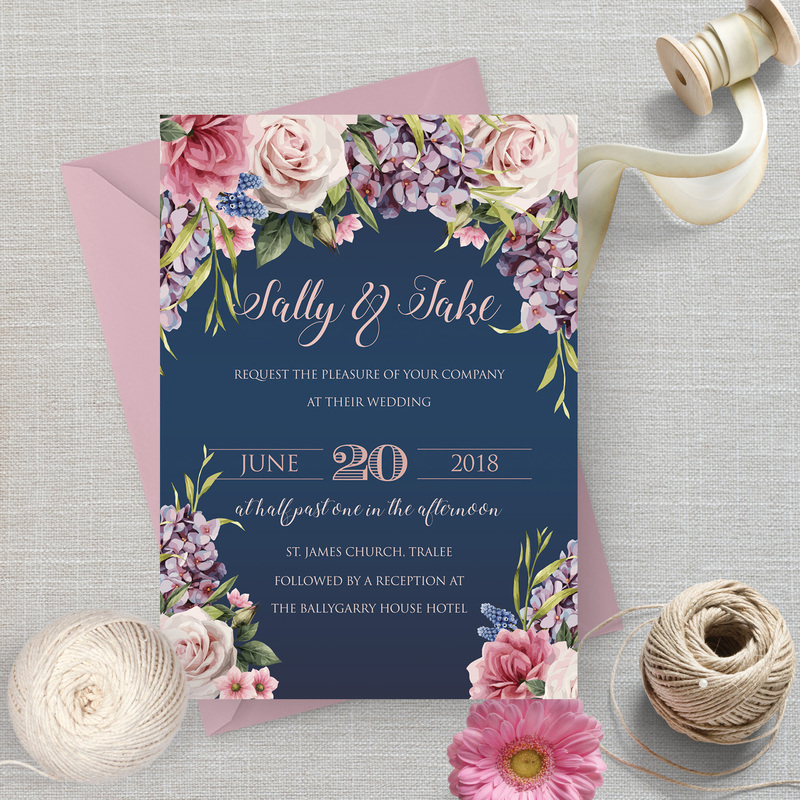 If there is a particular size of wedding invitations you need that is not a problem, we can create wedding invitations any size. 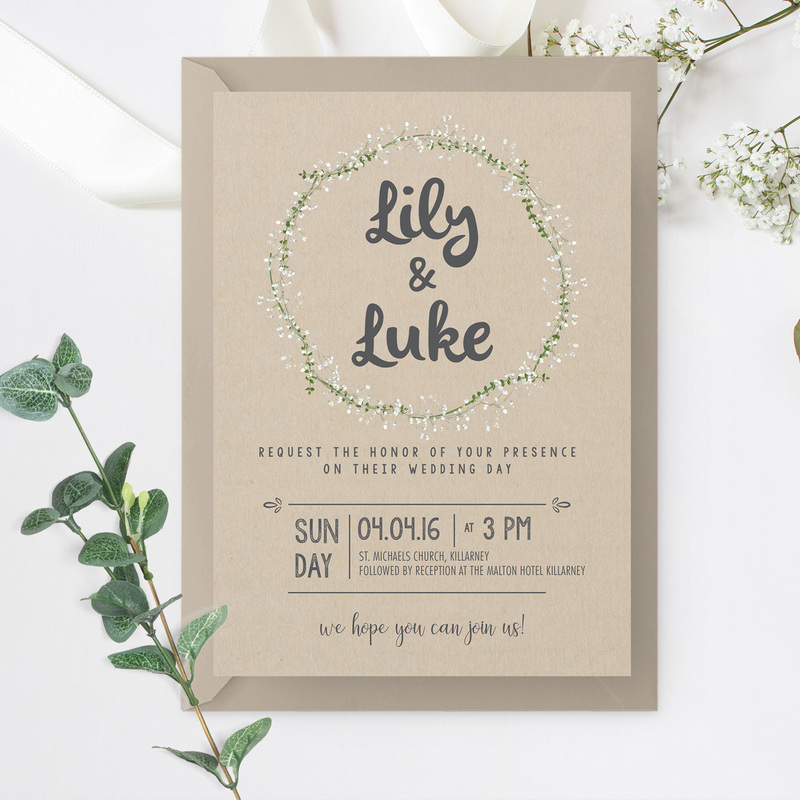 White envelopes are included with all wedding invitations. 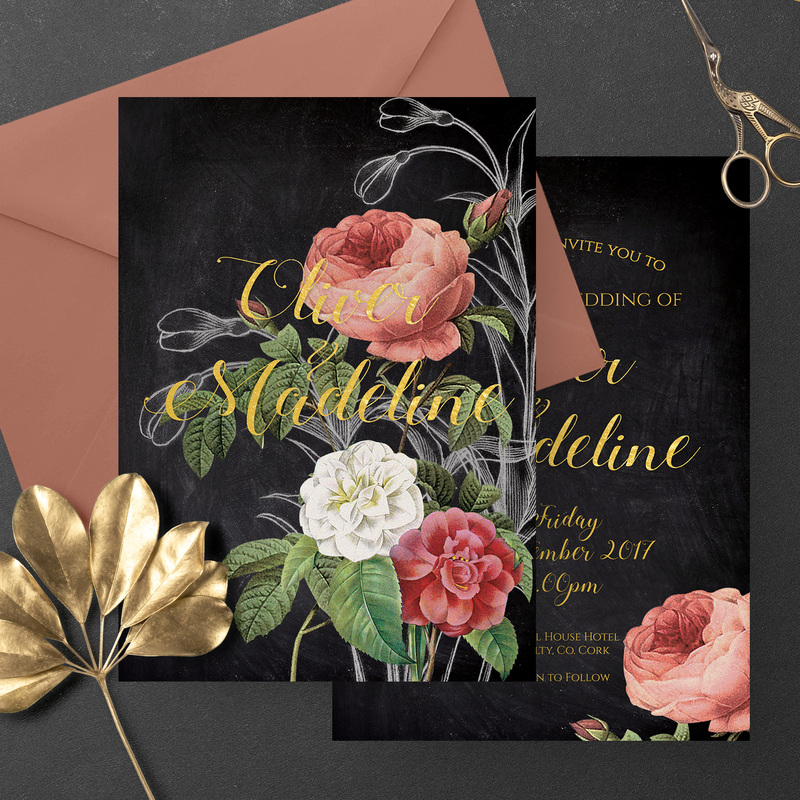 Greeting Card Style Wedding Invitation. 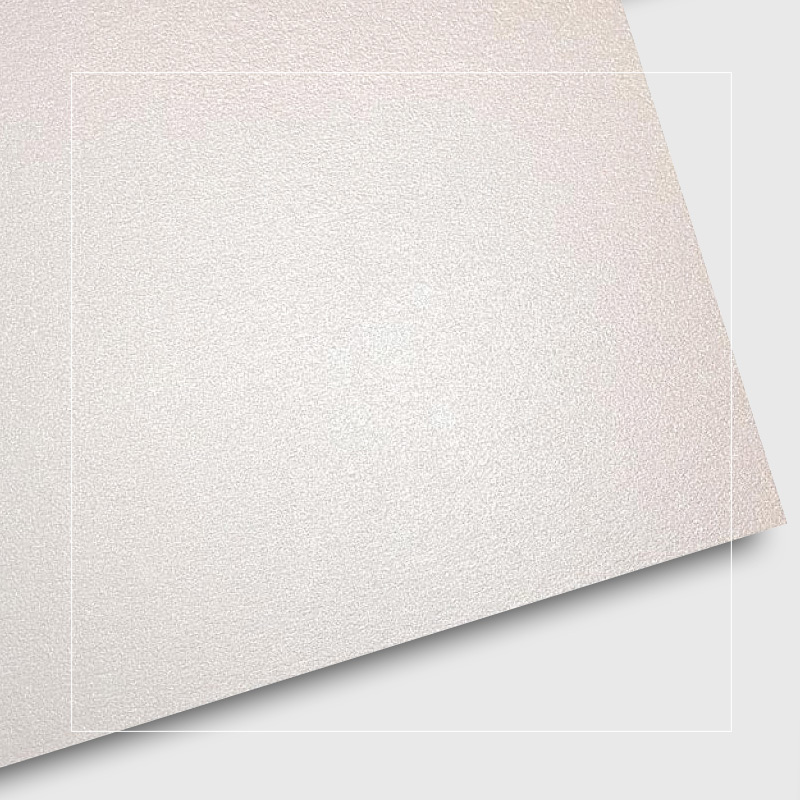 Two panels on the outside and two panels on the inside. Three Panels on the outside and three panels on the inside. 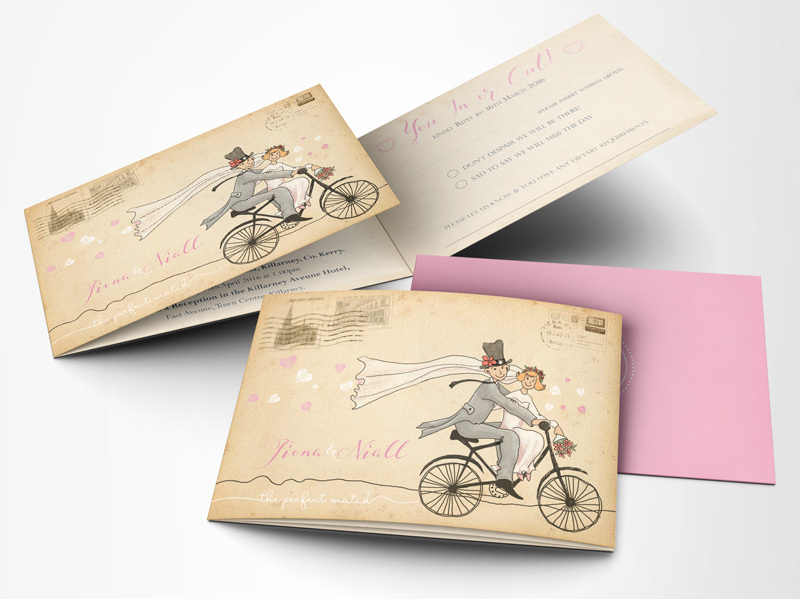 An ideal solution to combine your reply card or directions card into your invitation. 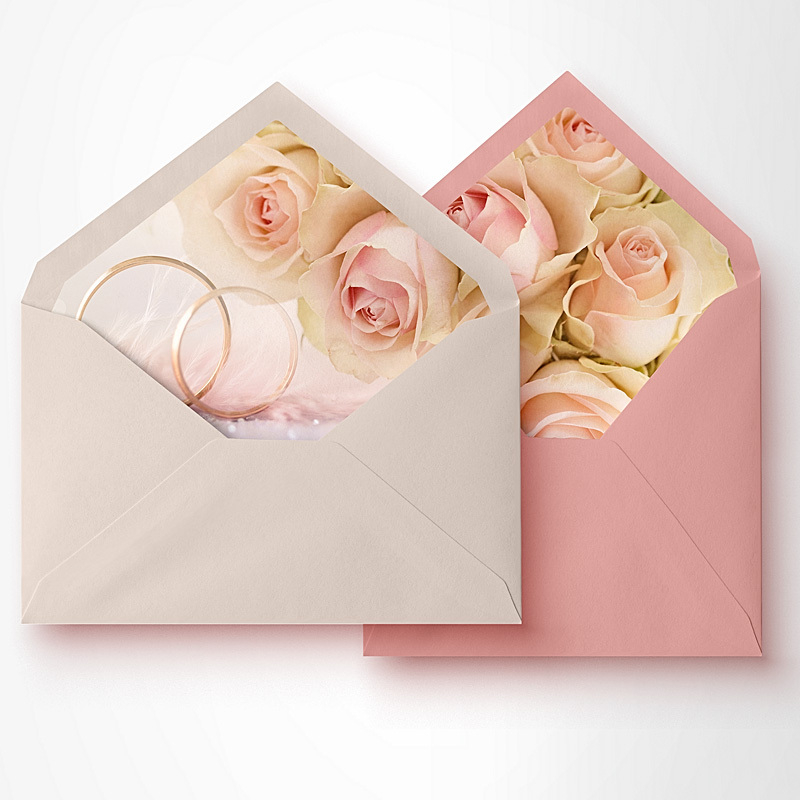 Get that WOW factor by adding a paper lining to the inside of your envelope that matches your wedding invite. 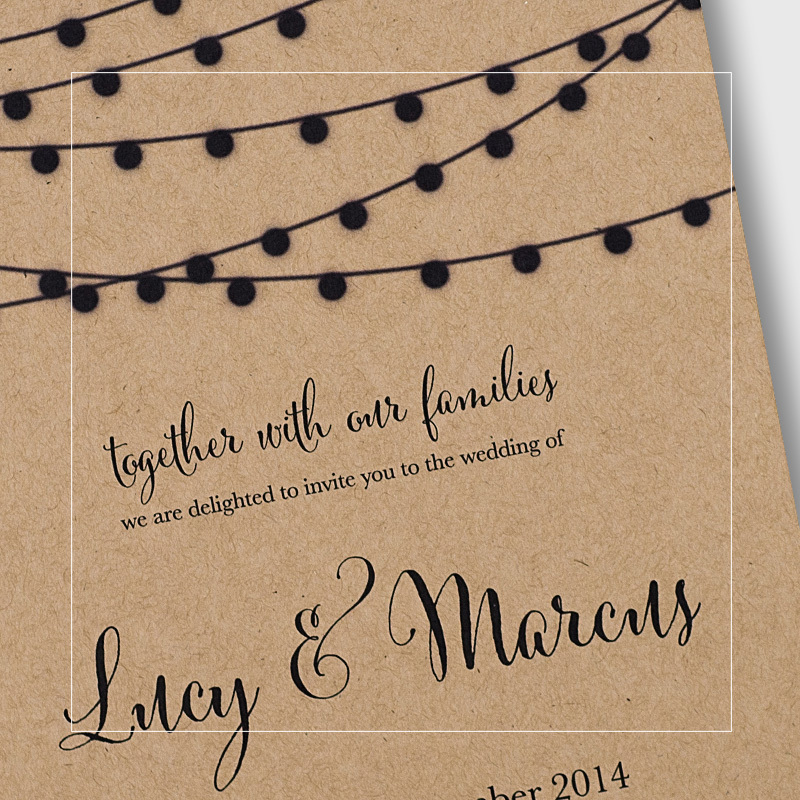 This inner layer is the first thing guests will see when they excitedly tear open your envelope. 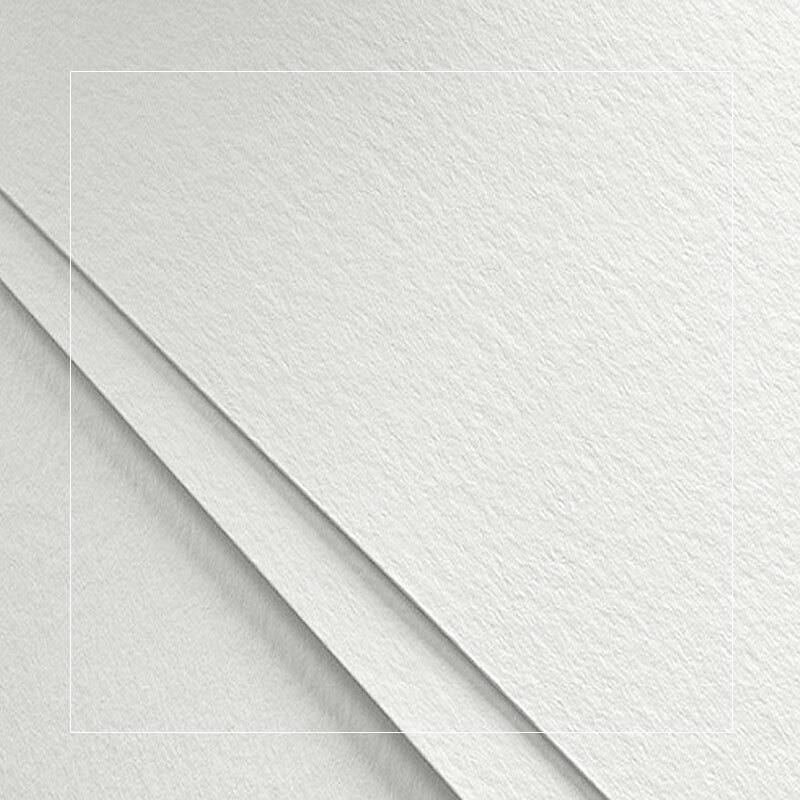 The printed envelope liner is glued to the inside of the envelope. 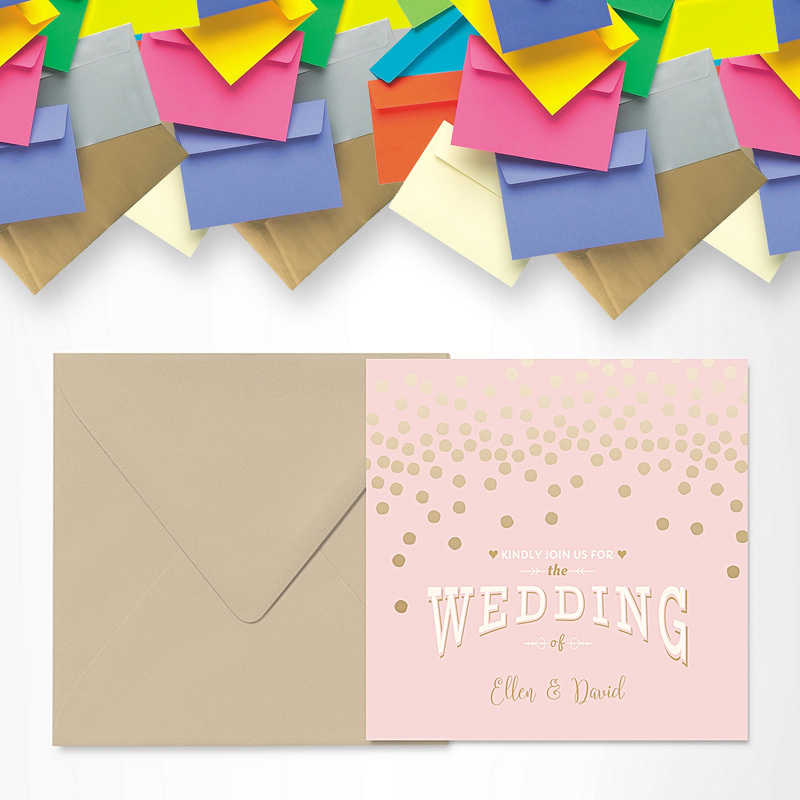 We have a huge selection of coloured, metallic and pearlescent shimmer envelopes available to match your wedding invitations. 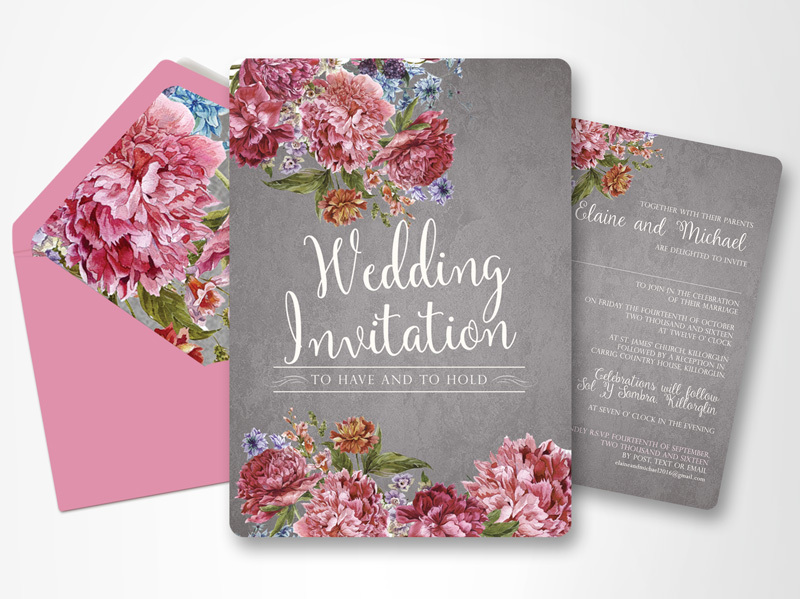 Make a lasting impression with your wedding invitation and add a matching envelope to set off your theme. 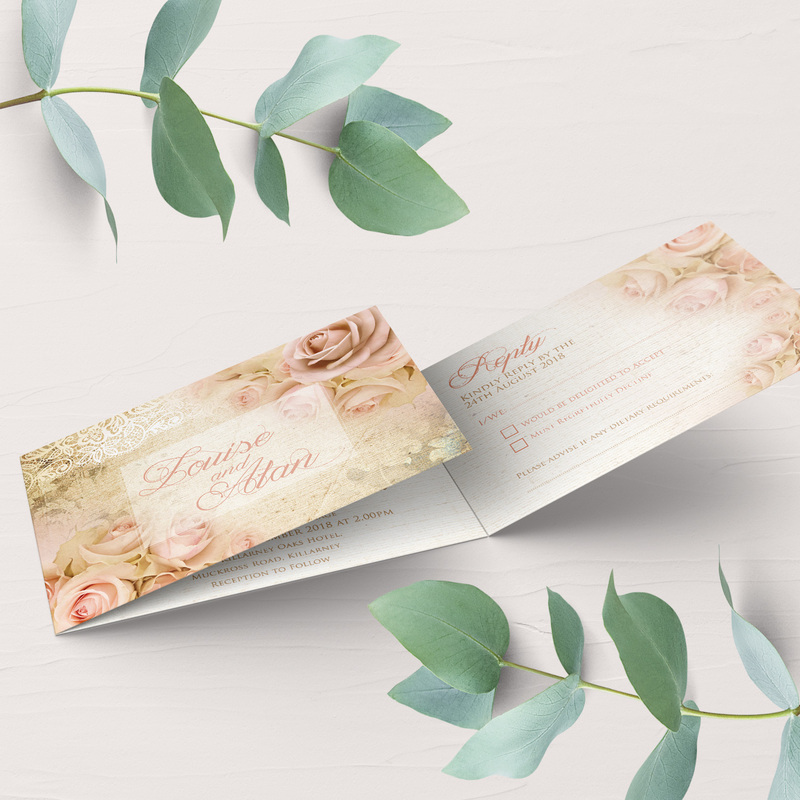 A Belly Band is an elegant band which is wrapped and sealed around your wedding invitation, RSVP reply card and reply envelope, packaging them perfectly together. 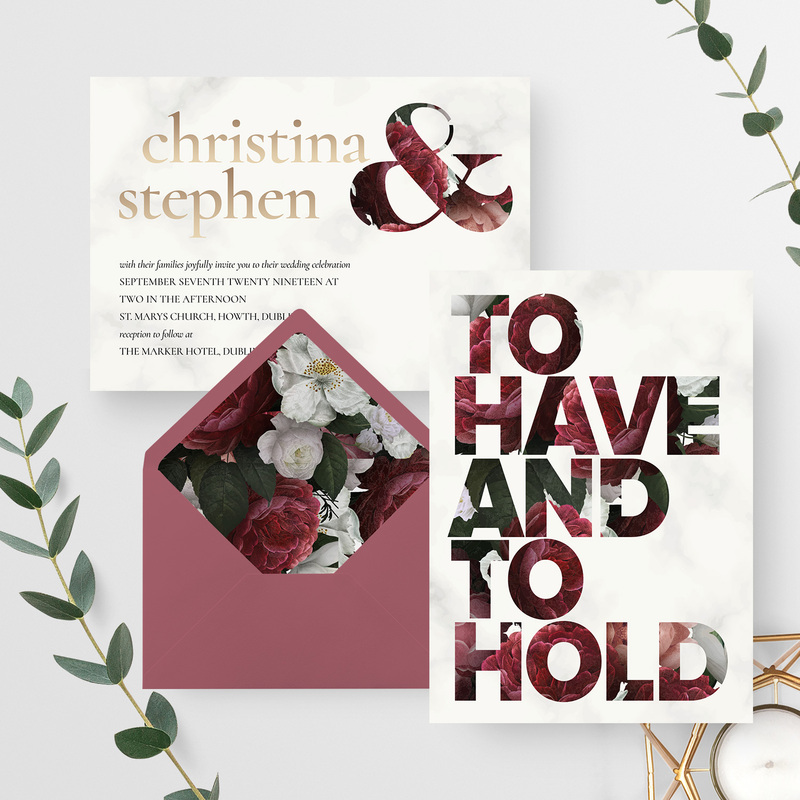 A perfect finish to your elegant wedding invitation. 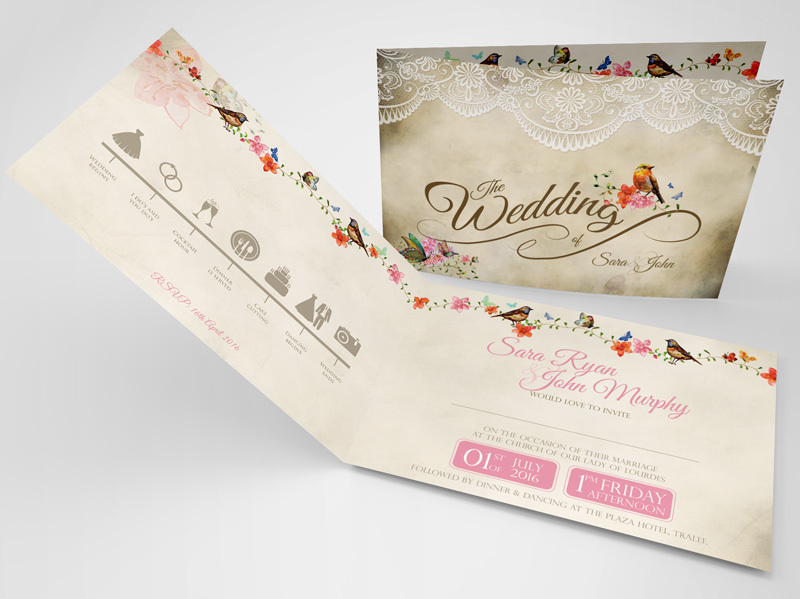 Also available in glitter bands for that extra touch! 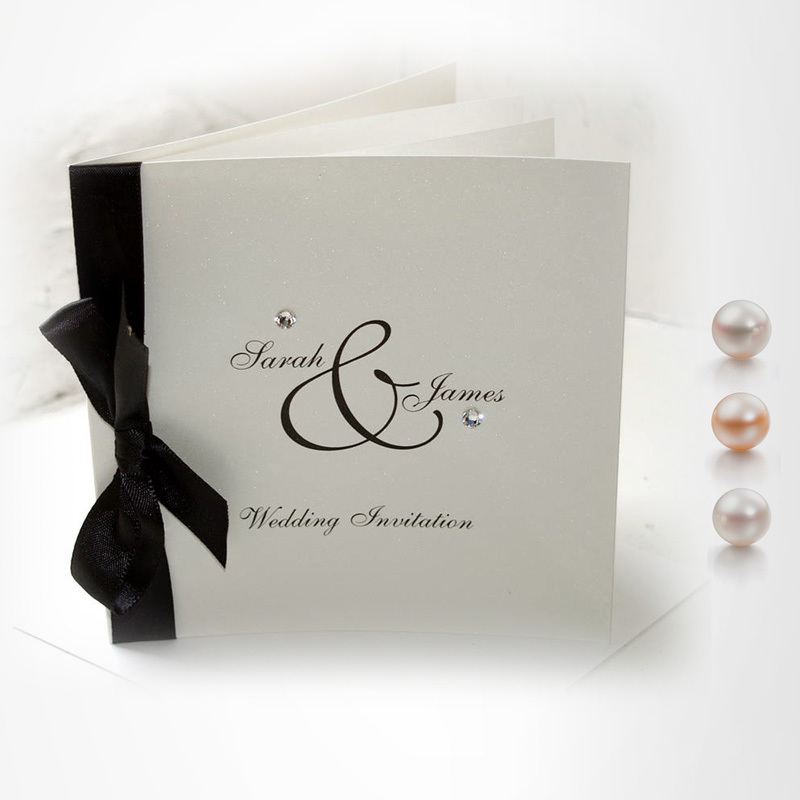 Add some glitz and glam to your wedding invitation with some Crystals or Pearls, Ribbons or Bows. 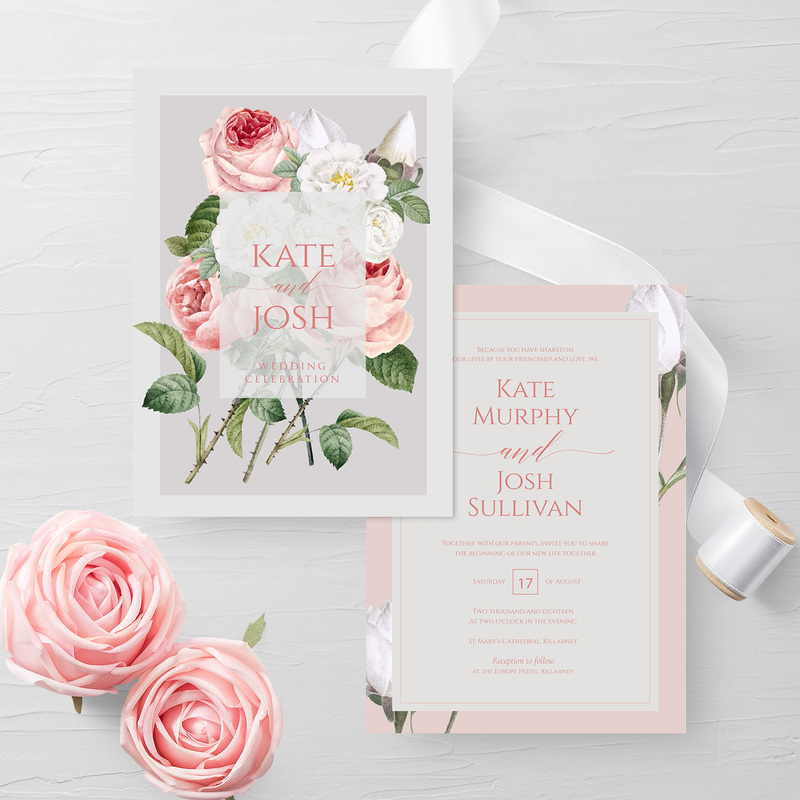 When you order these for your invitations they come assembled.